I first covered China Merchant Pacific Holdings in Sep 2011 which is almost 5 years ago. Today is probably one of the last post on CMHP because the parent made an offer for the shares it currently does not owned at $1.02 and the convertible bonds that are not converted. This represents a 20% premium over the prevailing trading price of $0.80. It is a bit bittersweet for me considering my history holding this company. It started out as a company with a New Zealand property business plus some toll roads with a huge cash holdings. At that time, the appeal was that it is net cash but also that it is paying a good dividend from net earnings, unlike many of the trusts that is paying out of cash flow. The problem is that, you are not so sure of it as a China firm. Over time, we got to know this company better. 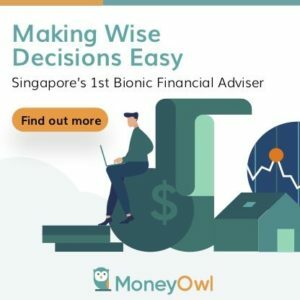 They sought so hard to acquire new roads, disappointing shareholders, until finally the parent gave them a bite in the form of YongTaiWen expressway a matured road, which significantly boost their earnings and the dividend yield. The business has a them of using low cost overseas debts to refinance the more expensive debt when they acquire a new expressway. Instead of conserving cash, they would use whatever cash flow to pay out the dividends, so that the dividends sustain the share price. A good share price would enable them to fund acquisitions by placement of new shares and debt. CMHP’s model is just like a trust manager. The roads are not too unique, except for where they passed through, and like the REITs, what is more important are the quality of management, to capital allocate well, to risk manage well. To evaluate whether the manager is aligned, you look at the past actions both in how they manage operations and debt but also what they acquire and how astute they are. YongTaiWen was a good purchase, but can be seen as the parents providing them this major road so that they can kick start a new direction. Beilun is a very short concession expressway that had it not been the refinance, would not be as attractive. At least the ROE hit 10%. It is after this that the recent acquisitions become questionable. Jiurui, a young road was supposed to be purchased for the first time, but they couldn’t sell off the New Zealand property business and hence the deal was called off. Then they went back for Jiurui at a cheaper price. This time we thought this is a distressed deal. That CMHP got a bargain. The results showed otherwise. A young road is suppose to show some better traffic and revenue growth figures. These are not my words, but the management words. We are not seeing ‘great’ growth rates. To make matters worse, the result of Jiurui got worse. Shortly after this, the management proposed doing a debt raising and rights issue to purchase three roads at Guilin. This heavily diluted current shareholders. The way I look at rights issue is this: It gives you the existing shareholders a chance to participate in good initiatives and to boost your income. That is, if the initiatives is really good. The 3 roads come in a package and in truth we would rather buy one of the roads. The rights issue didn’t go so well, as the stock market tanked and the price during the rights issue is below the offer price. No one in the right mind will subscribe to the rights issue. So the parent ate it up. Their original aim in 2011, was to reduce their 82% stake. They managed to do that. Now its back up to this level. The last AGM I did not attend, but from what I heard, there were a lot of questions asked. I think the Chinese Management is fed up. What is the point of explaining to minority share holders in a stock market that is unappreciative of its real value. In the SGX, CMHP will not get its true value. I beg to differ. 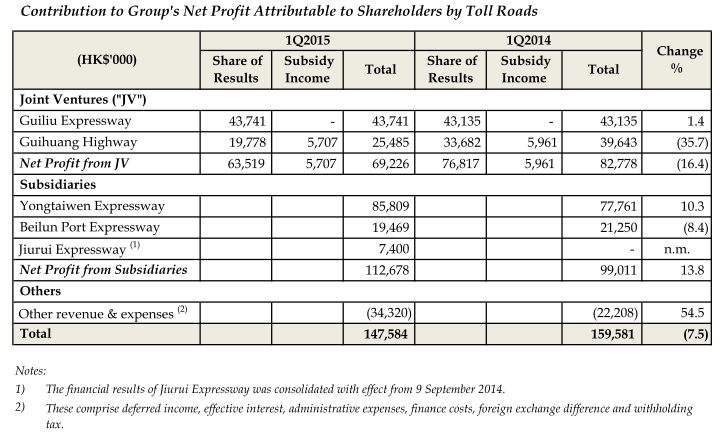 If you look at the PE versus the Hong Kong listed toll road companies, CMHP is not very cheap. In the past, every AGM someone will ask if they will dual list over there. And they highlighted their aim is to be as big as Jiangsu and Zhejiang expressway. I find that they realize, it is better to incubate the last 4 roads acquired. There have been much commentary when the share price fell. The narrative have been its attractive dividend yield and “great cash flow”. What befuddles me was how they derive the cash flow is great. The profile of CMHP now versus that in say 2013 was completely different. They are more diluted now, with only 1 to 2 roads supporting the cash flow with the rest of the roads in a funk. They have to do what Second Chance did by having the majority 80% owner taking scrip, or allocate the dividends to dividends payable. The cash flow forecast shows that they are flirting very close to the 7 cents dividend, to the point that a conservative dividend should be 6 cents. This is a far cry when you have a business that is paying of debt, with a stable YTW, and a Guiliu that is growing very well and dividend payout ratio of 50-60%. I pared down when I saw the result 2 quarters ago. I gave Jiurui 2 quarters to show me the growth rate was a fluke and it is indeed a bargain. It only confirms my suspicion we got something that is not going to perform very well in the near term. If these roads need time to mature, I think the communication could be better. Which is a problem for these China management in that while Jiang Yan Fei have been very cordial in explaining a lot of what we are blur blur on, making it clearer could address expectations. The price offer of $1.02 does look like an escape. I think its low but it is still fair. Much of the magic might be seen in 2017 for Jiurui, but perhaps the 3 Guilin roads also need more time to mature? CMHP taught me a few lessons, and I am grateful for that. Until now where so many is buying this S-Chip and I am now skeptical. During the challenging process, it also sharpens how we can try to determine if the cash flow is real. Specifically, take a look at how much tax is paid to withhold earnings from China that is flowing overseas, and the amount that CMHP have taken from us as minority shareholders versus what is being paid out. I missed out on few thousand dollars but looking back I based my decisions on the results that I see business wise. I have no complains. Unless I am an insider, I won’t know this offer is coming. The biggest reward from this stock was the friendship build up. I wouldn’t dig so deep in 2011 had it not been one young investor in Channel News Asia Forum who brought to my attention and I was gullible enough to dig the atrocious cash flow statement with him then (before YTW, most of the cash flow is from subsidy income and returns from joint venture that is not in the operating cash flow statement). Since then, I am glad to have someone who understands how I prospect stocks, and to critique upon the various nuances of various stocks listed on the SGX. The readers of Investment Moats benefit a lot over time because his sharpness eliminates a lot of the stocks that I would have thought were good but actually have much flaws. No CMHP, no friendship, no growth as an investor. That is more than I can ever ask for. Now I move on to the next problem for all investors who got such offer: Where to redeploy the money. Hope you guys can give me some suggestions. China Merchant Pacific Holdings (CMHP) recently announced their 4th quarter and full year results. This will be a short review of the results. In my last post on CMHP in June, it was during the time when the management did a combination of debt and rights issue at a price of $1.00 to purchase 3 expressways, Yang Ping, Guixing and Guiyang for HK$4 bil. Since then the share price have fallen to around $0.80. In the post, I voiced my reservations whether these roads will eventually turned out well and whether they can contribute adequately after the equity base expanded from 800 mil to 1200 mil to now 1800 mil. The profile of CMHP have changed a fair bit. Profit attributable to share holders fell from HK$739 mil to HK$597 mil. This was largely due to one off negative good will in 2014 due to the acquisition of Jiurui. This time round we can see how the organic profit looks like. For the first time in a long time, the EPS cannot cover the dividends. However do note that this result do not factored in the 3 new roads in Guilin. There are some one offs for CMHP over the years such as the sale of the New Zealand property business and the negative goodwill for acquisitions. The profit’s significance is that for China companies, the dividends have to be paid out from profits. If they cannot hit that profit, then they couldn’t pay out that much. Profit over the years have been rising organically, except in 2010 and 2015 is the year it shows that this is going down. To pay SG0.07 in dividend, CMHP probably need HK$726 mil. This compared to the time when they only need HK$250-$350 mil to pay the same SG$0.07 dividend. CMHP have always generated good free cash flow, but the free cash flow have to be used to pay down amortized debts. With Jiurui and the 3 new roads, there would be greater cash flow but also a greater amount of debt to amortized. Debt repayment would have to be prioritized over dividend payout. YTW have been the good performer out of all the expressway. It was able to get the good spillover effect from the diversion at Shangshan. Beilun, after the debt restructuring turned out to be profitable and earning well. 2014 saw its profits going down but since the improvement have been made to the roads, profitability have returned. Guiliu have been one of the main pillars supporting CMHP dividends, and the growth have been great despite the reduction in contribution in 2010. Performance in 2015 have been affected by road diversions, and this annual figure does not show the drop off in the traffic in the 3rd and 4th quarter. Guihuang’s traffic doesn’t look that bad on the surface, but we have to remember for these 2 years, the profit factors in some payments due to the relocation of toll gates in concession agreement. 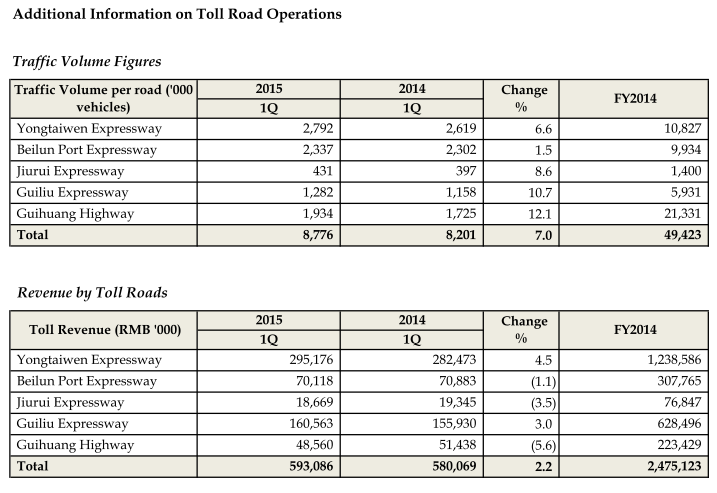 The toll traffic for Guihuang fell from 25800 in 2013 to 21000 in 2014 to 7800 in 2015. The full year profit before tax contribution is 19 mil. This is after debt restructuring. The 4th quarter traffic figures look really low and the profit figures look very weak. Management seem to indicate the bad result was due to a different mixed in vehicles. Had there been more trucks the figures would be better. This does not seem like what we expected from an undervalued road when they purchased it after they tried to purchase it unsuccessfully the first time round. To be fair, 2016 and 2017 will see more roads funneling to Jiurui, with 2017 being the significant one. The positive news for the 3 roads is that all of them end up profitable. However, there was no full quarter contribution and it is difficult to project what would be the likely full year contribution. My estimation is a full year profit before tax of HK$200 mil. With the new underlying debt from Jiurui and the 3 new roads, this will take net debt from HK$3.7 bil to HK$7.3 bil. In terms of net debt to asset, this is still a comfortable 29%. If we judge CMHP’s ability to service debt by Net Debt to Operating Cash Flow + JV Cash Flow, it is an uncomfortable 4.8 times. However, keep in mind that, we haven’t factor in much operating cash flow from the 3 new roads. I am expecting the estimated full year 2016 operating cash flow to be around HK$2 bil, which will bring the Net Debt to Operating Cash Flow + JV Cash Flow to 3.65 times. One of the financial engineering carried out by CMHP was to refinance expensive RMB debts in USD. This would provide a 2-3% savings in interest expense. This is how they swung Jiurui and Yang Ping from unprofitable roads to be profitable. However, with the possible devaluation of the Yuan versus USD, CMHP might lose this advantage. As long as the currency depreciation is within 2%, the interest expense savings are still worth it. Since Aug 2015, the USD have strengthen almost 5% versus the RMB. The earnings outlook of CMHP looks cloudy, especially at this juncture where some roads are not doing well, and there are roads that we have yet to see full year contributions. 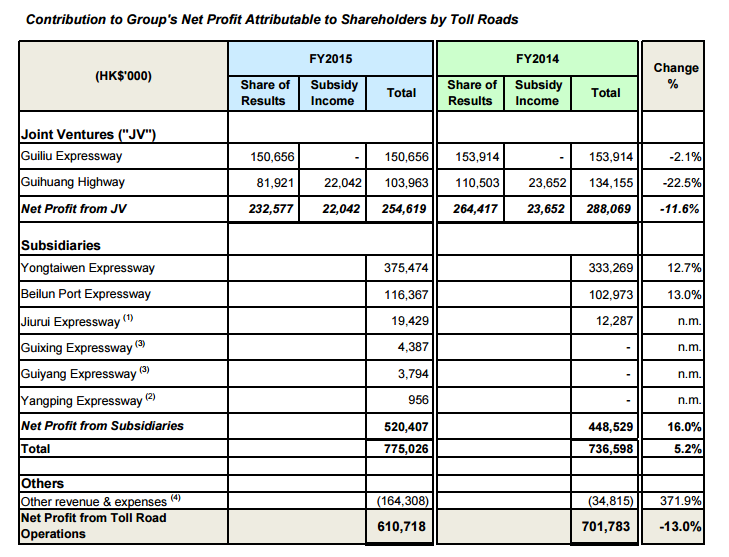 Assuming the 3 roads bring in $200 mil in profit before tax, and an of $50 mil in interest expense for corporate debts borrowed to purchase the new roads, this would add HK$150 mil to FY2016 earnings. If organic earnings of HK$532 mil do not grow, FY2016 projected earnings may be HK$682 mil. The EPS then is SG$0.065. The PE is 12.3 times or an earnings yield of 8.1%. If the growth of the 3 roads surprised on the upside, then they may be able to maintain the 7 cents dividend. Else the dividend might be cut. A 8.1% dividend yield, assuming a full dividend payout is still attractive, baring in mind that the dividend is paid out of earnings not cash flow, which is what most REITs and business trusts are doing. This ensures that cash flow are set aside to pay down debts or to recycled in new assets. However the profile of CMHP have changed. The margin of safety when it comes to the dividends is much different now. It used to be that they have 500 mil in earnings and they are paying out 300 mil, with roads growing in traffic well. Now it is they are paying out more dividends then earnings, with only 2 roads still growing earnings positively. The purchase of Jiurui and the 3 roads have left me being more unsure if Jiurui is more of a bailout then an opportunity, and make me question whether the 3 new roads would show that the managers are shrewd in their evaluation of assets. China Merchant Pacific Holdings (CMHP), an SGX listed toll road company, announced this week of the proposed acquisition of 3 toll roads, which will substantially enlarge the asset based of the company. Currently, CMHP’s assets consist of 3 toll roads spread out around China. It does not come as a surprise to shareholders following the company over the years that they will make acquisitions. What is usually intriguing is how they did it, and how it will turn out. This announcements does not have much figures to work with, so majority of my narrative will be rather qualitative. There are currently 2 broker reports on CMHP, both liked the acquisitions with DBS providing more numbers projections. As far as I know, it is likely the analyst are trying their best to project and for investors, the best is to use it as sensing but not trust them too much as the real traffic volume, revenue, profit is like to look very different. The total purchase price will come up to HK$4.02 bil. CMHP would need to come up with money to pay for it. Do note also that, in total the roads have HK$ 4.9 bil of underlying debt that CMHP would need to service. 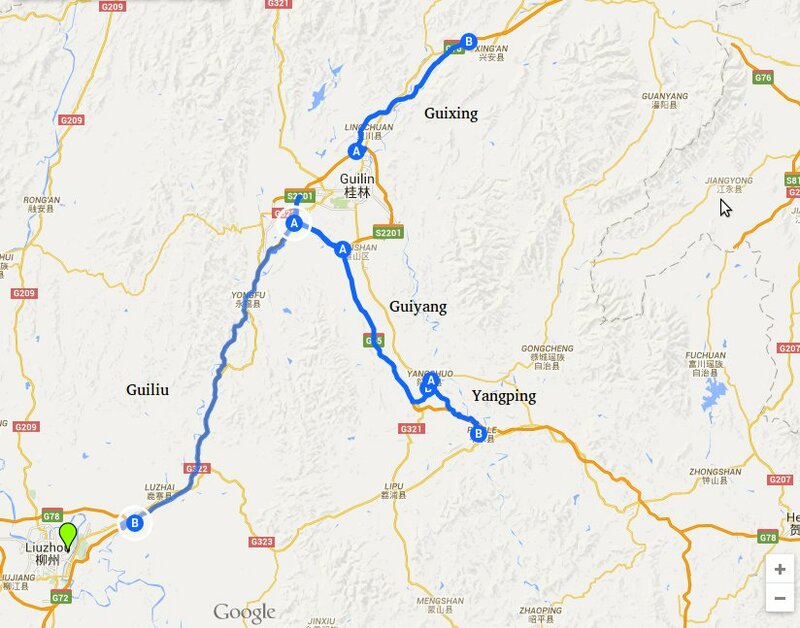 The google map above shows the three roads together with Guiliu, which is 40% owned by CMHP. 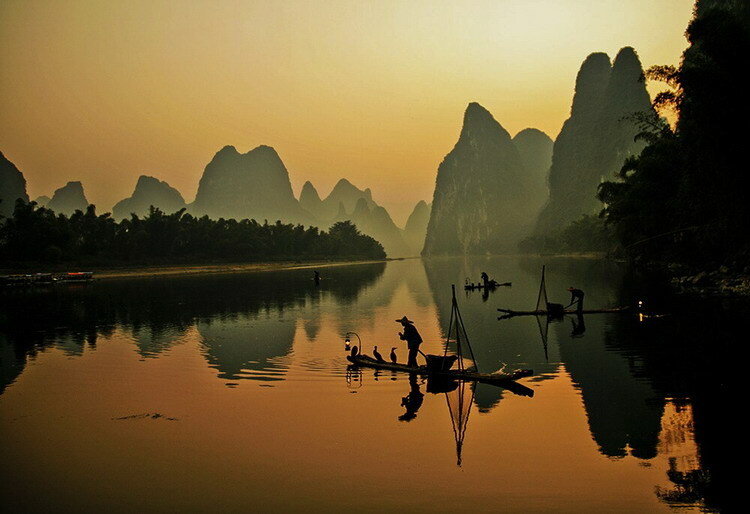 Guilin is a famous tourist attraction. I tried to find out if there are industrial manufacturing in the city, and it seems tourism does account for 20% of its GDP, so this means that should be vibrant. Of course volume growth does not determine profits, since the vehicle mix is also important. The Goods vehicle usually forms 70% of the revenue although their traffic volume is 30% of it. Non of YTW, Guihuang, Beilun had that kind of growth rate since we have the data. It gets worrying when we see the low growth of Guiliu in 2014, due to the change in road network and traffic diversion by high speed train services. Guiyang and Yangping started operation in 2008, while Guixing started operation in 2013. One benefit of this acquisition is to lengthen the average concession period of the whole portfolio. The first few years of a toll road are usually when they grow the fastest. In this case, both Guiyang and Yangping would have 6 to 7 years to grow, while Guixing should have its best growth years ahead. The above table shows the purchase price and the last profit before tax, MI and exceptional. The first observation is that Guixing cost much more than the other 2, perhaps due to its longer concession expiry. There has to be some high growth there for Guixing, if not its hard to justify majority of the purchase price going to Guixing. The remarkable thing about Guixing is that it is able to achieve a positive PBT of 44 mil in a short period of 2 years, while if you compare to Jiurui, which started in 2011, it was acquired at a loss, and only become profitable after CMHP refinance the debt. The best performing road among the acquisition is Guiyang with a 9.32% ROA. If they have the choice to purchase one, I wouldn’t mind buying only Guiyang. Yangping is the strange one. It is just an extension of Guiyang to Pingle County from Yangshuo, opened at the same time as Guiyang yet it is still loss making. Was the growth less than expected, or it is in the same situation as Jiurui, where its held back by high debt. If you put the 3 side by side, Yangping is the shortest, most unprofitable, which was operated for same length as the profitable Guiyang, why does it cost almost similar to a very profitable Guiyang? The hunch is that perhaps CMHP do not have much leeway. They cannot purchase only the good ones without taking on a poor one. Another guess is that they have a game plan ahead. Since now they owned both Guiyang and Yangping, they can move the toll stations to somewhere more profitable and sensible after analysis. With all 4 roads, CMHP control toll roads that are entering and exiting Guilin by land. These roads also link Nanning, the capital of Guangxi with the Quanzhou area after Xing’an. With Guiyang and Yangping, they tap into the traffic coming from Guangdong. The rationale of why the 3 acquisitions, why Guilin of all places, why purchase Yangping, more color on Guilin, Xing’an County, Pingle County, Yangshou should be some of the questions that the shareholders should pose to the management. The net profit for this year should be around the HK$870 mil region, which is up from HK$739 mil. However, this will be very much due to the bump from HK$218 mil in negative goodwill. This 3 roads will add an aggregate of HK$113 mil to PBT. CMHP will refinance the debt at the corporate level with cheaper carry trade loan. This we can forecast a 2% interest expense saving on HK$4.9 bil in debt, which is HK$98 mil. This brings PBT without growth to HK$211 mil. At a tax rate of 25%, Net Profit after Tax perhaps will be HK$158 mil. The interest expense on the corporate level, to finance the HK$4 bil acquisition will cost either HK$49 mil or HK$111 mil depending on the debt undertaken. The end result may be an increase of HK$47 mil in net profit, with a lot more dilution after purchase of 4 roads. CMHP in their announcement proposed 2 acquisition plan, which involved debt and rights issue. Both would result in more number of outstanding shares. From the table, the cash flow to pay the existing 7 cents of dividend would increase to HK$ 590 mil or HK$ 740 mil. In this case, Plan 2 would definitely result in dividend of 7 cents to be cut, since companies in China can only pay out dividend from earnings. Plan 1 is the favored one since the payout ratio would higher but it is still possible to pay out the dividend from perhaps HK$700 mil in profit. The conclusion is that, if the 4 roads do not grow, Jiurui and this acquisition will look very bad and should not have been made in the first place. They will grow, as what management say would track GDP growth in China, the question is more of the quality of growth. To a certain extend, I believe that there are operating leverage for the expressways, where an increase in revenue will add more to profit before tax than expenses, since maintenance effort should not go up proportionally. In the Guangxi region, Nanning is the capital of the Guangxi Zhuang Autonomous Region. It is also the most populated. The next 2 most populated region is Liuzhou and Guilin respectively, which is where Guiliu connects. Guiliu for me, grew well because of commerce as well as tourism from the folks in Liuzhou looking at Guilin as the closes quiet leisure destination from the city. It is disappointing that CMHP did not own a larger % of Guiliu. Guiliu contributed HK$160 mil in profits on 40% ownership. If its full ownership it would have contributed HK$400 mil in profits, which would far outweigh Yongtaiwen! Since a rail system have been put in place, we should expect growth to slow down to that of the population and GDP growth of the region. 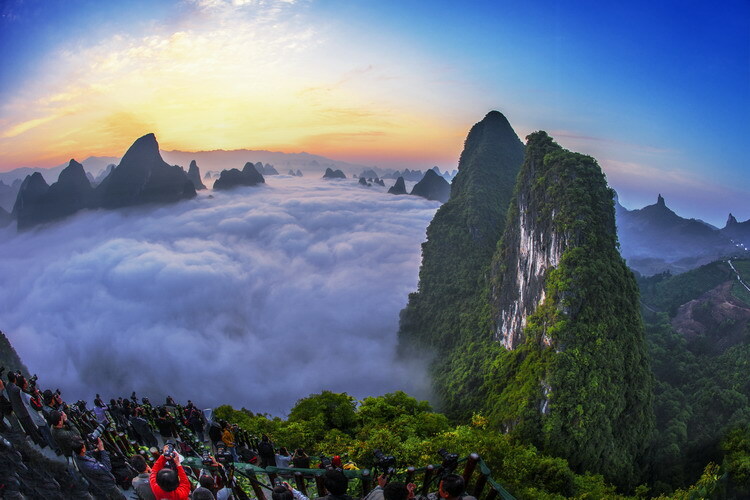 Xing’an, Yangshuo and Pingle are nearby county which is quite unlike Liuzhou. I do not think we would see the kind of growth that parallels that of Guiliu. Despite its fame, the city lags behind the national average in per capita GDP and average net income. It is also still on its way to expanding the tourism market while finding a balanced model to develop the industry. Last November, the National Development and Reform Commission approved a series of tourism plans that “will be principles to guide the city’s socioeconomic development, for now and the near future”, said Zhao Leqin, the top official in the city. 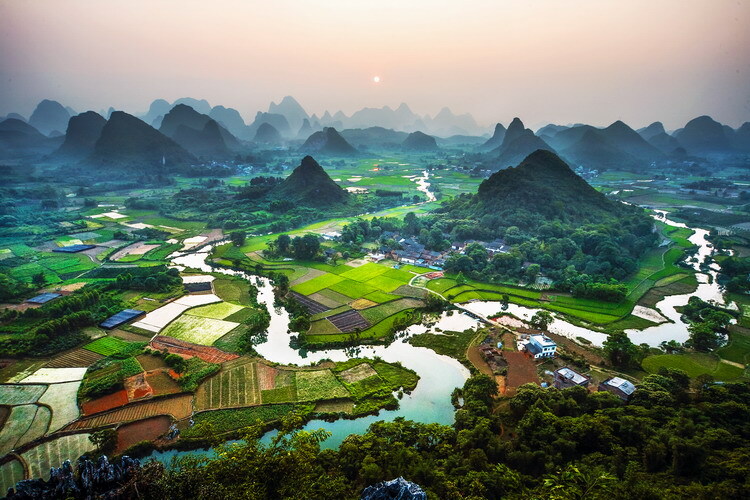 The blueprint calls for Guilin to become a world-class sightseeing destination, a national model for eco-civilization, a pilot development zone for tourism innovation and a regional hub for cultural exchanges. In addition to tourism, the guidelines also cover modern agriculture and services, low-carbon industries, transportation and logistics systems, environmental protection and social management. 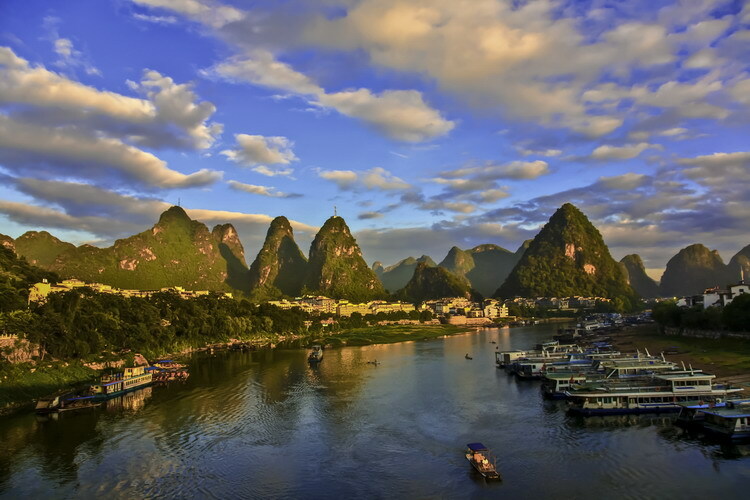 They also grant preferential policies to Guilin for land management, taxation, financing and investment. Zhao now envisions an industrial system that integrates tourism with other sectors as increasing attention is placed on improving livelihoods, market administration and eco-friendliness. The city government will first focus on improving services and infrastructure such as airports, railways and highways in the coming three years, he said. By the end of 2015, tourism is expected to generate 20 percent of local GDP, while the service industry is projected to contribute 40 percent. Over a longer term, the city’s goal is to become a world sightseeing and resort attraction and a platform for international tourism cooperation and cultural exchanges. Tourism will contribute more than 25 percent of the local GDP by 2020. By that time, the plan calls for the city to have an economy centered around tourism that is augmented by balanced modern agriculture, high-tech industries and advanced manufacturing. It will also develop a number of influential brands in tourism, culture and exhibitions. The city government has mapped out 23 functional areas, each with different focuses, and introduced many projects in tourism, infrastructure and services. In the Lingui New District, a pilot zone for innovative policies established in 2007, the administration planned 276 major projects last year with a combined value of nearly 20 billion yuan ($3.2 billion). This year, the city government will invest 56.6 billion yuan in 584 projects. 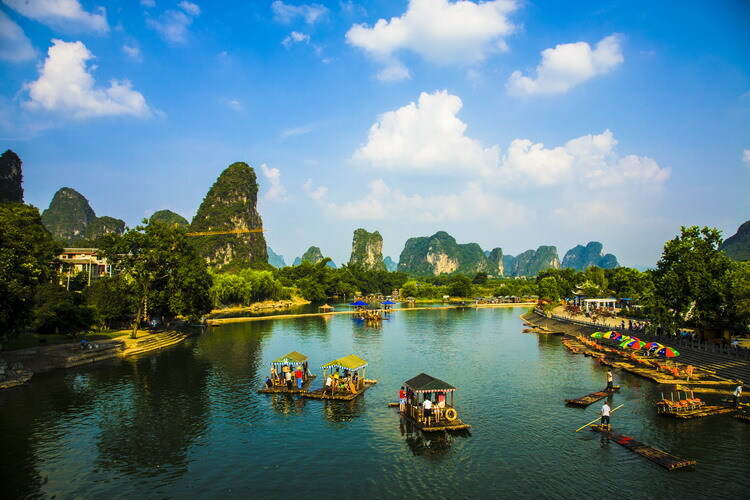 It will also host a number of international activities such as the seventh UNWTO/PATA Forum on Tourism Trends and Outlook, the fourth China Guilin International Tourism Expo and the fourth Guilin International Scenery Culture & Tourism Festival. Smaller-scale tourism promotion campaigns and festivals will be held in some districts and even suburban areas. City plans call for improvements in the local transportation network including high-speed railways and highways that link the city with neighboring regions. It is also laying the groundwork for a bonded logistics park adjacent to the airport. 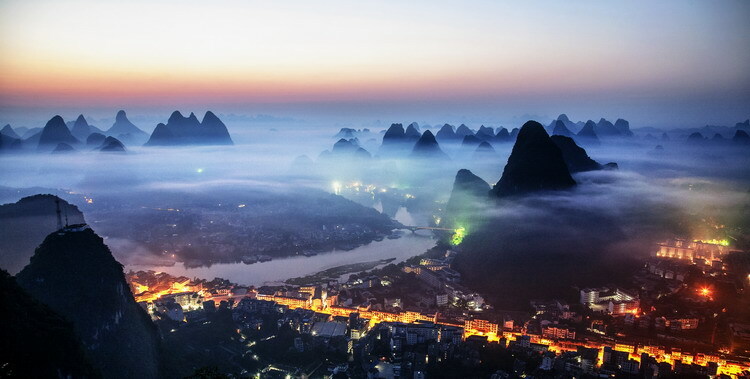 Guilin was endorsed by the National Development and Reform Commission, China’s economic planner, in November, which means the central government will offer favorable policies in support of Guilin’s development of its tourism industry. 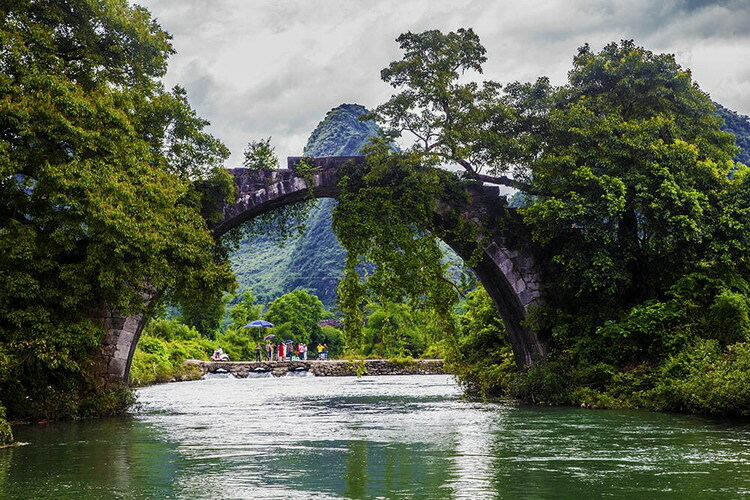 Wang Wei, director of the social development department of the National Development and Reform Commission, said on Tuesday that special policies will be applied to Guilin to support its development. Guilin’s Liangjiang International Airport, which became operational in 1996, handles 5.8 million passengers a year, already above its capacity. Work started in November to achieve the capacity for 12 million passengers by 2020. 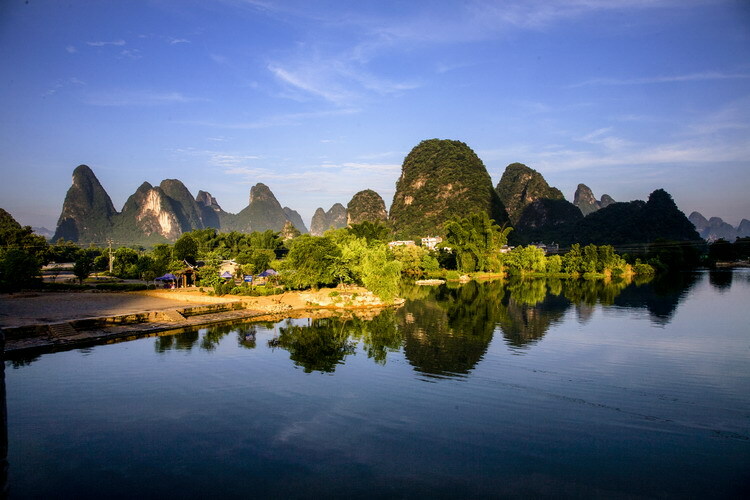 While modernization of the transportation system is bringing more visitors, the city has been trying every way to protect the local tourist attractions, especially the Lijiang River, one of the most beautiful rivers in China, which Zhao called “the soul of Guilin’s scenery”. 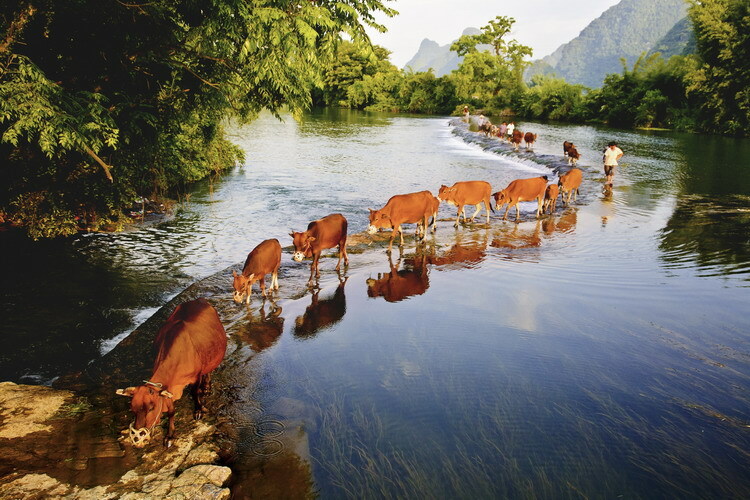 Guilin has been making progress in the ecological preservation, tree planting, and water protection in its upstream areas. Despite Guilin’s fame as a tourist city in China, Zhao admits more work still has to be done. It remains a challenge as to how to encourage visitors to spend more time in the city. Domestic tourists spend only on average 2.7 days in the city, and overseas tourists even less time. From the Financing Plan table, the debt to asset leverage will go up from 20% to 40% or 48%. We do not have the eventual EBITDA figures, but I am estimating total EBITDA to be HK$2.4 bil. The Debt to EBITDA ratio would increase from 1.75 times to 4.68 or 5.5 times. Both Debt to Asset, and Debt to EBITDA shows that CMHP have moved from conservatively leverage to highly leveraged. This looks dangerous and uneasy, but not so much if you look at how leveraged Cityspring and SP Ausnet was. 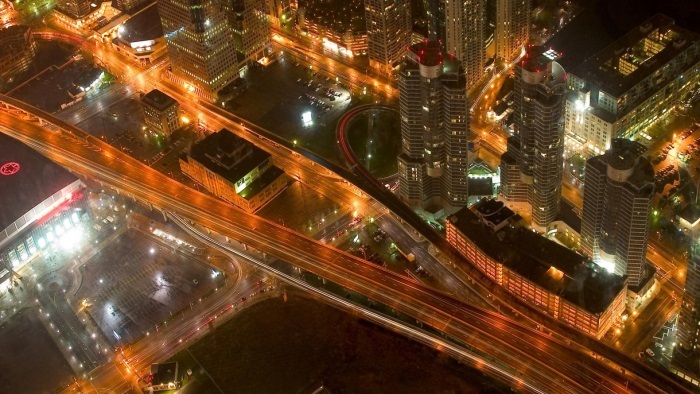 Assets such as toll roads, utilities are able to take on high leverage because their cash flow is predictable. When that premise is violated then things will start unraveling. In times of crisis, the ability to secure reasonable priced financing is also an important factor, and it will be interesting if their affiliated state owned bank China Merchant Bank have problems coming up with loans for CMHP. The way I see it, CMHP should be spending some time to deleverage to HK$9 bil, where the debt to EBITDA is closer to 3.6 times and debt to asset 36%. The management have mentioned in the past that they don’t aim to be small fries when they want to list on the HKSE. This acquisition enlarges the portfolio by 39% to 575km. This deal makes CMHP the second largest private toll road company if it is listed on the HKSE. The uneasy thought is whether they are growing impatient and was given a mandate by the parent, that they have to get it listed as soon as possible. The intention is clear that they are aiming for it, for investors the question is whether CMHP will be rated better on the HKSE. Based on the valuation of the companies mentioned above, only Jiangsu and Zhejiang, the bigger ones trades at a higher price earnings ratio. When the market runs wild, CMHP can be expected to match their price earnings, so the possibility of that premium based not so much on fundamentals are there. Reflecting on the last 2 acquisitions, that is Jiurui and this 3 roads, this is according to what the management outline. It is not surprising. And you know its coming. The balance sheet is ready for it. It is the manner of the acquisition that sits uneasy for me. 3 out of the 4 roads are work in progress, not immediately accretive, results in dilution of shareholders holdings and depends much on the management foresight. If we are owner operators, and are privy to whether these are really outstanding opportunities which are distressed or presents great future growth, things would have been easier. I came out of this acquisition not liking how it turned out. If the purchase is Guiyang alone or another Yongtaiwen, I probably won’t make that much noise. I guess there are more questions to ask of the management selection but also much monitoring of the growth of Jiurui and these 3 acquisitions. The appeal of CMHP is their ability to refinance at cheaper debt and as long as the acquisitions grow at greater the rate of interest rate borrowed or cost of equity capital, this investment is good. If the growth rate disappoints over time, then this does not make a good investment. There are much known unknowns, and uncovering such unknowns such as the future potential of the region, traffic growth and commerce, tourism growth, it will present different perspective of whether there is value or this investment is overvalued. Mean time do enjoy some of Yangshuo’s Karst Landforms below! China Merchant Pacific Holdings (CMHP), a toll road operator whose parents are the Chinese state owned enterprise China Merchant Holdings, announced their first quarter results on Thursday, after their annual general meeting. I manage to attend the AGM, and while there weren’t much questions officially asked, I manage to observed some questions that Mr Jiang Yan Fei, the ex-CEO was able to answer. I will firstly review their first quarter results, and then share some of the points explained by Mr Jiang. In terms of overall profitability, there weren’t much difference. Results were rather flat. In terms of administrative expenses and interest expenses there were not much changes as well. Traffic results was rather subdued. We didn’t see the kind of explosive growth that we were looking for in Jiurui. Typically a young road like Jiurui should be growing at above GDP rate. Perhaps we should wait for full year to comment. Guihuang continues to disappoint in terms of revenue. Despite the traffic growth over the last year, perhaps a change in vehicle mix result in a poorer revenue. I was rather disappointed that the miracle that is Guiliu have stopped contributing great growth for 2 quarters. The toll revenue growth rate moderated due to the change in road network and traffic diversion by high speed train services. Guihuang showed the biggest disappointment. Toll revenue was further affected by the decrease in traffic flow of large goods vehicles following the use of a large local road transportation logistic center and the traffic diversion by a neighboring toll road after the completion of its major maintenance work. Profit contribution from Gui Huang Highway decreased 35.7% compared to the same period of last year, which was much higher than the decrease in toll revenue of 5.6%, mainly due to one time compensation of RMB13 million received from a local government linked enterprise for the loss of toll revenue resulted from the construction and use of a link road that connects to Gui Huang Highway in the first quarter of 2014. Excluding the one time compensation, profit contribution from Gui Huang Highway would have increased 10% over the corresponding period of last year. In terms of free cash flow (operating cash flow – interest expense – capex – tax), I computed that the quarterly cash flow to be HK$ 303 mil versus HK $331 mil. If not for an addition of HK$62 mil capex, free cash flow will be similar. Some one at the AGM did highlight to me something we should consistently monitor and that is when earnings increases, we should observe similar increase in contribution from free cash flow as well. For new readers, it should be noted, that Guiliu and Guihuang’s cash flow contribution does not take place every quarterly since they are received as dividends under the Investing Activities under Cash Flow Statements. Total Assets tallied at HK$ 15.8 billion. Cash stands at HK$1.36 billion. Total debts, including dividend payable stands at HK$ 4.59 billion. The net debt to asset is 20%. This is low by REIT or business trust standards, but you have to bear in mind the concession period is much shorter as well. Of the debts, HK$ 600 mil is in convertible bonds, which should be converted by the end of the year. Interestingly, Mr Jiang mentioned that there are clauses in the bonds that, if i read what he says correctly, allow CMHP to mandate they convert the bonds. So the net debt should be closer to HK$ 2.63 billion. 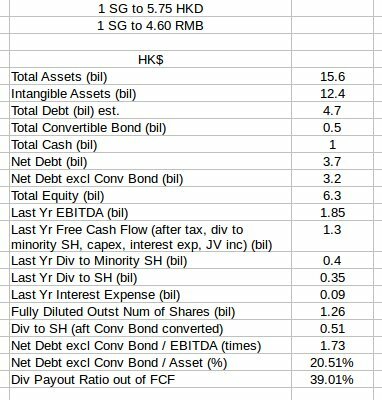 The full year 2014 free cash flow for CMHP was HK$1.3 billion, and so the net debt to free cash flow ratio is 2 times, which is rather conservatively low. Its even lower if you compare it to the net debt to EBITDA of the REITs and business trusts. In this quarter HK$62 mil from free cash flow was used to repay debts. CMHP share price have ran up a fair bit, perhaps heavily influence by the developments in China where the stock market have been on a good run. Assuming all convertible bonds converted, the diluted outstanding number of shares will be 1200 million. Market Cap in HKD is $8,241 million. In the full year annual report, Yongtaiwen’s 49% minority shareholding stake was made clear, that the debts accounted all this while by CMHP was for their 51% stake. In this case the Enterprise Value is $8241+ $2630 in net debt = HK$10871. Since we are using FCF instead of EBITDA, we can tolerate a higher number. My usual undervalue indicator for EV/EBITDA was 6 times, with 8 times being fair. This makes CMHP looks reasonable at 8.36 times. But when you compare against peers, which are usually around 6-7 times, CMHP does not look cheap. Price earnings = $8241/ $626 = 13 times. I use the full year 2014 share holder’s profit, taking out the one time income items. 13 times looks on par with the Hong Kong listed toll roads Jiangsu and Zhejiang. This likely indicates that CMHP isn’t cheap at this price. Even if you purchase it at this price there isn’t much margin of safety. When a stock reaches fair valuation, it is time to switch, but my caveat here is, you better have something that is cheaper or higher yielding to switch to. Much of the valuation can change if CMHP is able to leverage up their conservative balance sheet and acquire HK$4 billion worth of roads. From the looks of things, which i explain below, that looks possible. Some one was puzzled how come there are some roads where, over the years showed not much improvement in traffic yet revenue and profits were better. Mr Jiang explained that this was due to the changing in the mix of traffic. Typically the vehicles using the expressway can be group as passenger vehicles and transport vehicles. The transport vehicles make up 30% of traffic but 70% of the revenue and the passenger vehicles the opposite. So a change in the mix would result in a change in revenue. In a past post I talked about how the government are looking to redevelop the areas around Guihuang and that the concession will be cut short to 2021. Some one asked Mr Jiang more on this and he draws up and explanation to us more details. Excuse the poorly drawn picture. 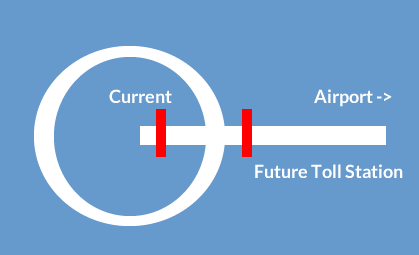 The red rectangles represent toll stations current and future while the white indicates roads. Basically the toll station was in the way of urban development works so CMHP was compensated and the toll gates was shifted out. From the look of things, Mr Jiang do not expect it to be an adverse development. It might even be better considering there are much traffic from trucks in the round about circle that weren’t captured in the past when the toll stations were in the current location. The results in this quarter looks worse off partly due to the relocation of the toll station, as well as a road put up to divert the traffic away from Guihuang expressway. No figures was given, nor updates whether revenues will be restored to previous levels. Mr Jiang was asked about the potential acquisition prospect for CMHP. He highlighted that publically listed roads in China forms 10% of total amount of expressways. The rest is made up of unlisted small companies owning roads but also government own roads. They total up to 3,154 km. While I may have missed out some, this covers most of the main companies. Mr Jiang provides the figure that the total amount of toll roads is roughly 100km with listed amount 10km, so the figures doesn’t add up. The important thing here is that there are many not listed still. Whether they are unfragmented enough to acquire is another matter all together. He also highlighted that based on statistics, the long term growth of expressway tends to mirror that of the GDP growth rate of China. The state government looks to continue with spending on infrastructure as cars become the main form of transportation as the people becomes more affluent. Mr Jiang explains that to acquire the toll roads from parent China Merchant Huajian or Holdings is difficult, as the majority of them are partially owned by listed entities. As such most of the deals that they look at are likely to be from third party. When question whether there are more and more government or private operated roads, that are heavily financed getting into delinquent situation, Mr Jiang stated that they are seeing more of such potential deals. The outlook for replenishment of tolls, where concessions will expire, seems promising. We hope that this translates to another Jiurui type of acquisition, but this time more matured. I enjoyed this CMHP price run up but firmly focus on the business side of things. CMHP currently is rather conservatively leveraged and with 1.3 bil in FCF i can see them paying out 500 mil and using 800 mil to pay down debt. CMHP’s advantage is buying reasonably serviceable expressways, that are in distress with 5.9% interest rate China debt and refinance them with low interest rate USD debt to earn the spread. Of course it is up to the management to be stringent about the expressway that they purchase instead of going for every expressway available to them. Much of the growth lies in these acquisition and without them, CMHP doesn’t look like an attractive purchase at current price.